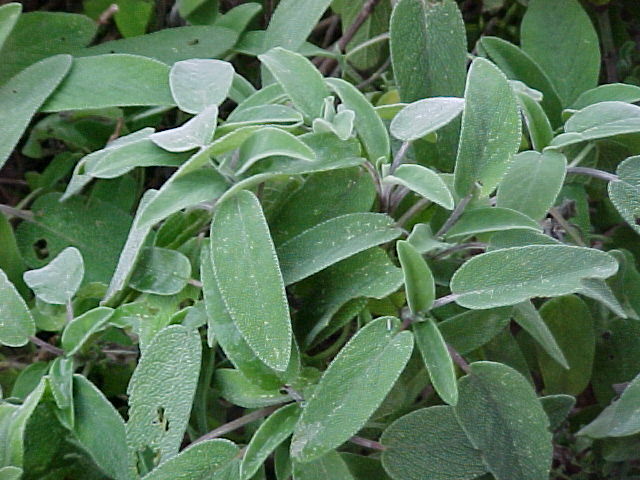 Sage is a strongly flavored perennial herb. It is today less used than once it was, but is still one of the more important kitchen flavorings. Its commonest use is with strongly flavored meats, but even vegetarians will find many uses for it. This is another herb with a horde of differently flavored cultivars: there are probably between a dozen or so races of just Salvia officinalis, plus many more “quasi-sages” that are close cousins within the Salvia genus (such as “Pineapple Sage” or “Clary Sage”). As with rosemary, the many purely floral uses of the plant complicate finding good information on purely culinary uses. It appears that “Dalmatian sage” (from Yugoslavia, particularly the Dalmatian coast) is generally considered the best, but that seems likely to just be another way of specifying “real” sage (S. officialinis) in contrast to the “near-sages”. One university says “The best culinary sages are the plain narrow-leafed and non-flowering broad-leaved types”, which is at best minimally helpful. In fact, it appears that the best culinary sage is none of the special types, but rather any sound specimen of “common or garden” S. officialinis, though at least one source says the race “Albiflora” is the best culinary sage. Another popular race of S. officialinis is “Berggarten”, a smaller, bushy type supposedly especially good in pots and said to be the best culinary variety. We grew “Holt’s Mammoth” outdoors, but—because we want a continuing supply of fresh leaves—have switched to growing indoors, using Berggarten (S. officialinis “Berggarten”). Like almost all herbs of Mediterranean origin, sage likes mediocre but slightly alkaline and very well-drained soil, and lots of sun. It is a perennial, but best replaced every few years (one source says every 4 years). It can be grown from seed, but normally one buys it as a plant from a reliable specialist. Sage takes well to indoor growing; given scope, it can reach a good size, but—as we rarely want much, owing to the intensity of its flavor—it is as well to restrict it to a smaller pot. Sage, once established, is drought-tolerant, but easily falls victim to “wet feet”, so keep it watered regularly but with a light hand; don’t let its soil get really damp. When harvesting, one ordinarily only wants a little at a time, but in any event never take more than about a quarter of the foliage at one time. Older leaves will be more strongly flavored, and are best for cooking; younger leaves have a lighter taste, and the venturesome can use them in salads, omelettes or scrambled eggs, and suchlike dishes. Plants should be pruned each spring, lest they get “leggy” (some use the phrase “severely pruned”); remove the top half of each branch, which will encourage new growth from the base of the plant as well as from the branches. Take care not to cut old wood. The lower leaves on sages—especially those closest to the ground and inside the plant—often die during summer; always remove dead leaves as soon as you notice them. Some further light pruning at other times of the year is probably a good idea too; in general, try to achieve dense but open foliage that will encourage good air circulation through the leaves. Sage can be vegetatively propagated with fair ease, and taking and starting cuttings every couple of years is a good way to keep your sage supply vigorous. Sage is a strong flavoring, and—as with rosemary—the cook not well experienced with it is advised to use it with a distinctly light hand till confidence is gained. It was last modified on Tuesday, 5 February 2019, at 01:05 EST.